Hope all of our friends in the blizzard's path are staying safe and warm inside with hot chocolate, great books, and lots of kitty cuddling time! That's what Mommy and I will be doing...even though the sun is shining! You got the new Cat in the Stacks Mystery!! !OOOH Man!!!!! * jealous * We love Charlie and Diesel!!!!! OH PS (sorry) We forgot to comment on the blue Mudpie. Nearly forgot as its about C27/GF80 here today..... Is Mum coming to BlogPaws Mudpie??? Beautiful Blue picture! I love it. It is frame-worthy! I have that mug, too! We prefer frost to snow. It's always kitty cuddling time!!! That's a cool photo! Even blue, you look lovely, Mudpie! Let's be honest, though, I'm also a tad bit jealous of all those getting snow this weekend. We're not getting a single flake either. Regardless, we are sending warm wishes to all those getting snow! Well looks like you are making your own snow Mudpie. We got a little snow here which is totally unusual. That does look like a good book. Great picture. We are so happy that the sun is shining here and there is no sign of snow thank goodness. Sorry, Mudpie. 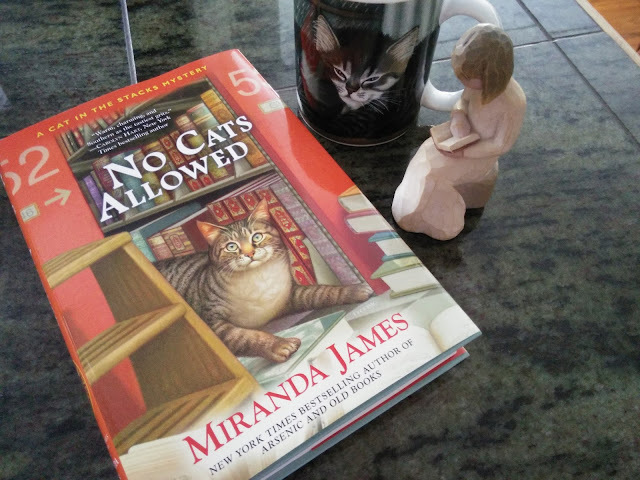 Lucky Mommy has an early copy of No Cats Allowed, though. That makes a few of us "green with envy". :) Happy reading! 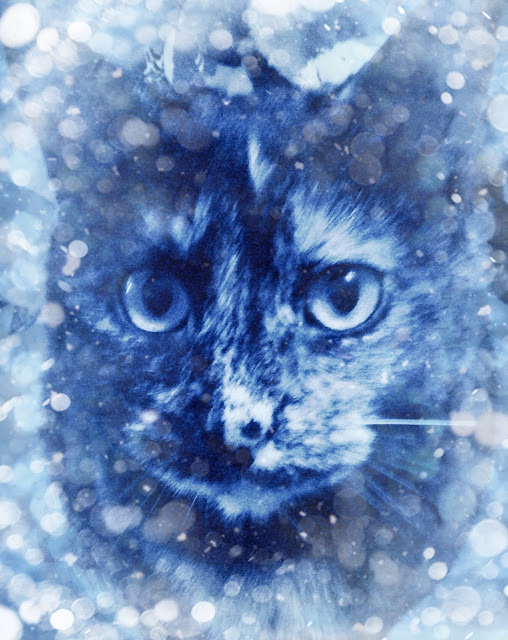 Count your blessings dear Kitty ... you are in the safe zone, the others have much more than just snow to deal with. Though a few flakes would have been nice ... always fun to have that white stuff around. And great story line shots is that a good book to read? Mom is excited to know the new Diesel mystery is out! She going to the library website to put it on hold. You look really cool, Mudpie!! I bet a lot of people wish they didn't have snow. You look beautiful, nice art. Lovely photo! We are jealous too, though we do hope all are friends are safe. OOOH! This looks like a good book! Can't wait to read your review, Mudpie! And I love your arty snow photo! No snow here either...and it doesn't bother us at all! Oohhh... A Cat in the Stacks Mystery? EXCELLENT. Sounds wonderful, for sure. PS. Snow is supposed to miss us, too, and I have to say, I'm super-happy 'bout that. Last winter nearly did my Peep #1 in. I need her. She opens the tins. You can have this record snowfall we’re having.